Brian clears debris from Waddell Creek to improve drainage. Intent on trying out my newly renovated rear brake bridge (increased clearance), I contacted Brian for a Sunday ride with dirt. Gazos Creek Road couldn’t have been a better choice, although I wondered if it would be muddy from the recent rains. Hardly. It hadn’t rained since Dec. 24, plenty of time for the road to dry. 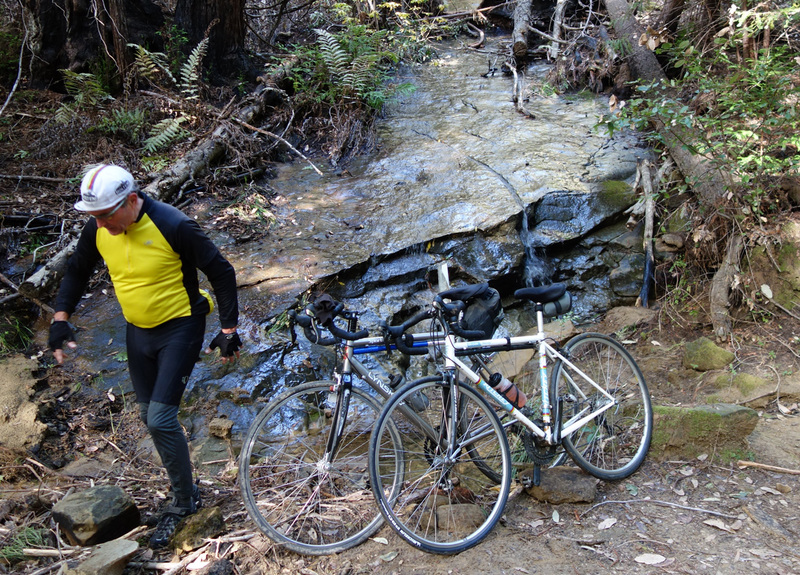 I’ve been enjoying Gazos Creek Road through Big Basin State Park since 1980, following Jobst Brandt and friends on one of his regular clockwise circuits down Hwy 9, 236, Gazos Creek Road, home on Pescadero Road. While the temperature never went much above the mid-50s, we enjoyed filtered sunshine and the late-afternoon sun climbing Alpine Road. 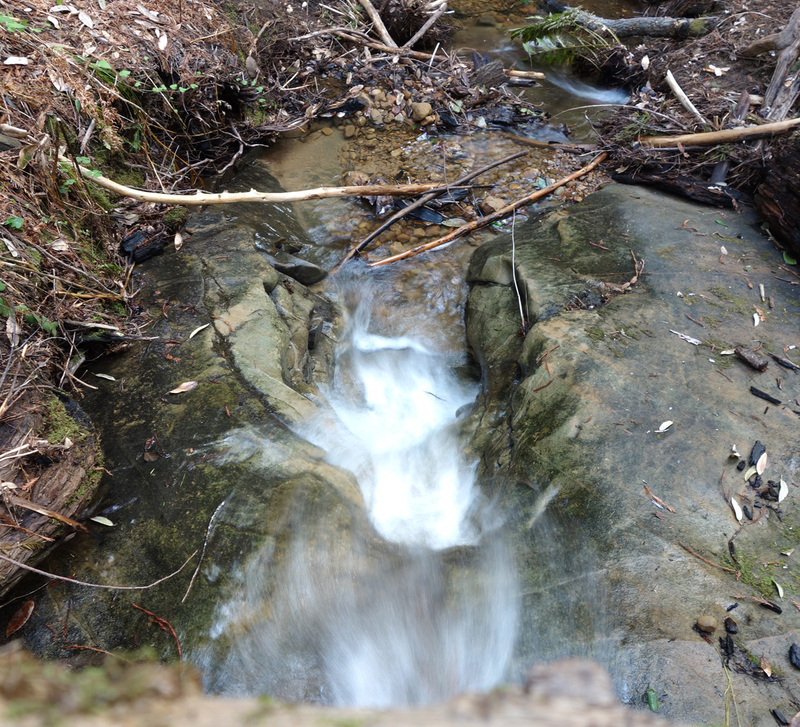 We stopped at a tributary of West Waddell Creek, which had been all but dry last winter. Now it’s a burbling stream where the man-made cut in solid rock channels water into an inviting pool. Many a car stopped at this spot to tank up on water for the inadequate, always thirsty radiators of the day. After passing the summit encampment where a ranger station once stood, we headed steeply downhill, thankful that the deep gravel dumped here in years past had all but disappeared. A few short stretches of gravel didn’t slow us down. By now it was almost 2 p.m. and a quick calculation told me that it would be dark before I got home. In his later years, Jobst often descended Page Mill Road in near darkness, a feat I was not anxious to emulate. We hustled up Alpine Road, discarding the Hwy 84 option because while less steep, it added four miles to my route, so it was a wash. Alpine Road is so much more fun anyway. There’s nothing more beautiful than a late-afternoon climb on Alpine Road. We made it down Page Mill with plenty of light and then it was a fast ride home. This entry was posted on January 6, 2015 at 1:13 pm and is filed under Ride reports. You can follow any responses to this entry through the RSS 2.0 feed. You can leave a response, or trackback from your own site. Wow, it looks like you made the trip with standard road tires. I’m only brave enough to make that trip on a mountain bike.